Haemisphaeria Sphaerarum Rectae Et Obliquae Utriusque Motus Et Longitudines Tam Coelestes Quam Terrestres Ac Stellarum Affectiones Monstrantia. A fine 1708 Andreas Cellarius celestial chart illustrating the motions of the upright (the Equatorial Coordinate System) and oblique spheres (the Ecliptic Coordinate System), the Celestial and Terrestrial Longitudes, and the influence of the stars. The surround is lavishly decorated with finely engraved and colored images of clouds, putti, and two sub-diagrams. It is of note that this is beautiful colored example with giltwork incorporated into the color. 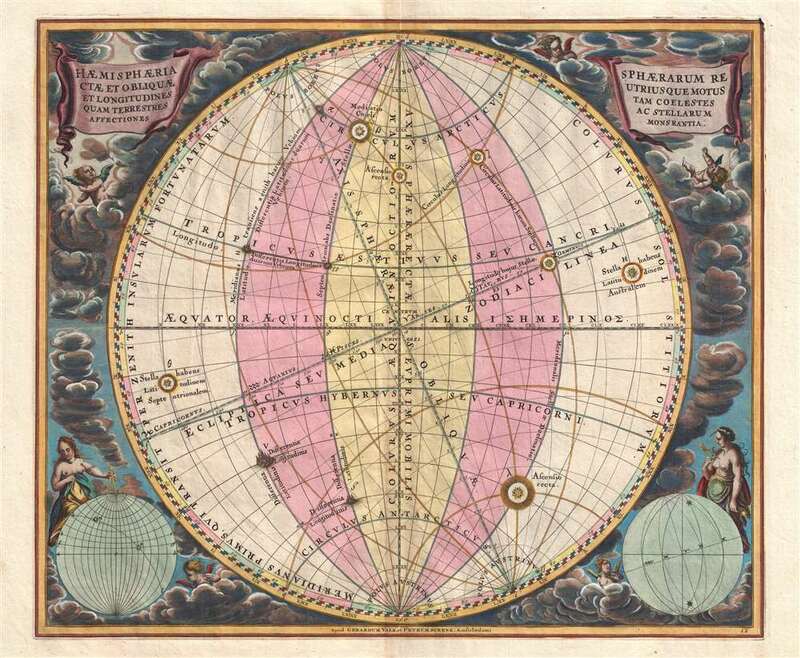 Cellarius first issued this chart in 1660 in conjunction with map and atlas publisher Johannes Janssonius. The present example is from the 1708 Valk and Schenk edition of the Atlas Coelestis. Andreas Cellarius (1596 - 1665) was a Dutch-German cartographer, mathematician, and astronomer. He was born in Neuhausen (now a part of Worms), and was educated in Heidelberg. Cellarius, being Protestant, may have left Heidelberg in 1618, at the onset of the Thirty Years' War, or slightly later, in 1622, when the city fell to Catholics. His activities are unclear at this time but based on his later works it is conjectured he spent time in Poland where he may have taken work as a military engineer. In 1625. he married Catharina Eltemans in Amsterdam, where he taught Latin. After a brief stay in The Hague, the family moved to Hoorn. From 1637 until his death he was rector of the Hoorn Latin School. Today Cellarius is best known for his Harmonia Macrocosmica of 1660, a major celestial atlas, published in Amsterdam by Johannes Janssonius. Gerard Valk (September 30, 1652 - October 21, 1726) was a Dutch engraver, globe maker, and map publisher active in Amsterdam in the latter half of the 17th century. He studied mathematics, navigation, and cartographer under Pieter Maasz Smit. He later worked in London for the map sellers Christopher Browne and David Loggan. In 1687 he established his own firm in Amsterdam in partnership with Petrus (Pieter) Schenk, who married his sister in the same year. They published under the imprint of Valk and Schenk. Initially they published maps and atlas, acquiring the map plates of Jodocus Hondius in 1694. Later, in 1701 they moved into the from Hondius offices where they began producing globes. Valk and Schenk quickly became known for producing the best globes in the Netherlands, a business on which they held a near monopoly for nearly 50 years. He joined the bookseller's guide in 1711. Around the same time Gerard introduced his son, Leonard, to the business. Leonard was nowhere near as sophisticated a cartographer as his father and ultimately, through neglect, lost much the firm's prestige. After his death the firm was taken over by his widow Maria. Petrus Schenk (Pieter Schenck) the Elder (December 26 1660 - 1711) was a Dutch engraver, globe maker, and map publisher active in Amsterdam and Leipzig in the latter half of the 17th century. Schenk, was born in Elberfield, Germany. He moved in Amsterdam in 1675, becoming the apprentice to Gerard Valk (Valck). In 1687, Schenk married Agatha Valk, Gerard Valk's sister and went into partnership with his brother-in-law under the imprint of 'Valk and Schenk'. Initially they focused on maps and atlases, acquiring the map plates of Jan Jansson and Jodocus Hondius in 1694. Later, in 1701 they moved into the former Hondius offices where they began producing globes. Valk and Schenk quickly became known for producing the best globes in the Netherlands, a business on which they held a near monopoly for nearly 50 years. Schenk's three sons, Pieter Schenk the Younger, Jan Schenk, and Leonard Schenk, all became engravers in their own right. Pieter Schenk the Younger inherited the business and ran his father's shop in Leipzig. His daughter, Maria Schenk, married Leonard Valk, the son of Gerard Valk, and continued to run the Valk and Schenk map engraving workshop in Amsterdam. Cellarius, A., Atlas Coelestis seu Harmonia Macrocosmica, (Valk and Schenk: Amsterdam) 1708. The Atlas Coelestis; Seu Harmonia Macrocosmica is an important celestial atlas by Andreas Cellarius first published in Amsterdam by Jan Jansson in 1660. Not only is this the only celestial atlas published in Amsterdam before the 19th century, it is also the most decorative celestial atlas ever produced. The atlas was lavishly illustrated in baroque ethic and contained 29 extraordinary charts. The first 21 constitute a historical survey of cosmological theories, illustrating the motions of the sun and planets according to Claudius Ptolemy, Nicolaus Copernicus, and Tycho Brahe. The subsequent 8 plates are constellation and planetary charts. Although originally conceived of as a two volume set, the second volume never materialized. Despite criticism by prominent contemporary astronomers the first volume proved immensely popular and went through three printings, 1600, 1601, and 1666. In 1694 the Jansson plates were sold to Gerard Valk and Petrus Schenk who produced a similarly lavish edition in 1708. Very good. Slight wear on original centerfold. Else fine.